The SPD party conference called to debate whether the party should start formal coalition negotiations with the CDU/CSU has just voted. Of the 642 delegates, 362 voted for the GroKo, the new Grosse Koalition, 279 against. One confused person abstained. The Young Socialists above all did not want to go into another coalition with Merkel, fearing the party would only lose even more support from its base than it did at the last election. However, the lure of power, of ministerial salaries and limousines won the day. There can be no doubt that the formal coalition negotiations will succeed. In other words, to repeat our Golden Rule of German politics ad nauseam, 'nothing ever changes'. If you don't track Randall Munroe's website xkcd.com you will have missed a recent, very clever cartoon. 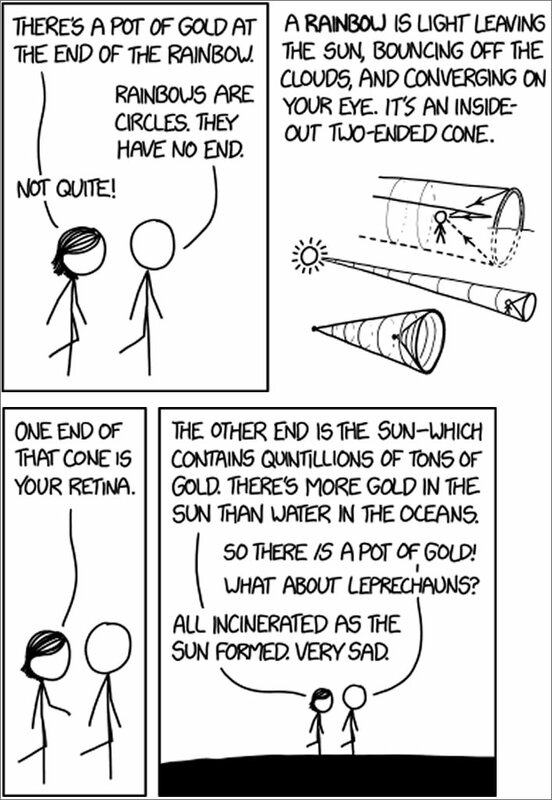 Randall Munroe, The End of the Rainbow: 'The retina is the exposed surface of the brain, so if you think about a pot of gold while looking at a rainbow, then there's one at BOTH ends'. An 'inside-out two-ended cone' – quite. There are no circumstances under which an adult with even only half a brain should get onto a sledge and propel themselves down a sledge-run. The Creator of the Universe designed adults, in respect of sledging, for the purpose of pulling small children up small hills and releasing them at the top. Small children are designed to bounce. The ability to sit or lie on top of a sledge whilst hurtling down an alpine sledge-run was never part of the design brief for adults, so don't do it. For some reason elderly people – who, one would think, would have more sense – get on these things and whizz downwards with only their brittle appendages poking out to stop them. In Switzerland one person is killed sledging every year on average. The most recent fatality occurred this month in Andermatt, when a 64-year-old woman lost control in a curve, went over a low cliff and ended up on the railway line. Around 7,000 are injured to a degree severe enough to be recorded. Many of them end up in hospital, where they will get to know intimately their new-best-friends-forever: pain, discomfort, titanium screws, steel plates, wheelchairs and walking sticks. These faithful friends will be with them for months at the least, possibly the rest of their lives. No one will be surprised to learn that most accidents result from collisions with other idiots or with protective fences and such like placed there by more idiots and, of course, impacts with those innocent victims, long-suffering trees quietly getting their winter sleep. Those who want to protect their feet, ankles, legs and pelvis may prefer to go down head first. In Switzerland on official sledge-runs only half of those in the battering ram position choose to wear a helmet. Let's not discuss what happens to hands, wrists, arms and shoulders. So, after a day's skiing in the alps, perked up by a bevy at the après-ski and a bottle of something to wash down the schnapps-laden fondue, what can be more romantic than a moonlit stroll to the local sledge run shortly followed by a romantic helicopter flight with the bone fragments still sticking out. 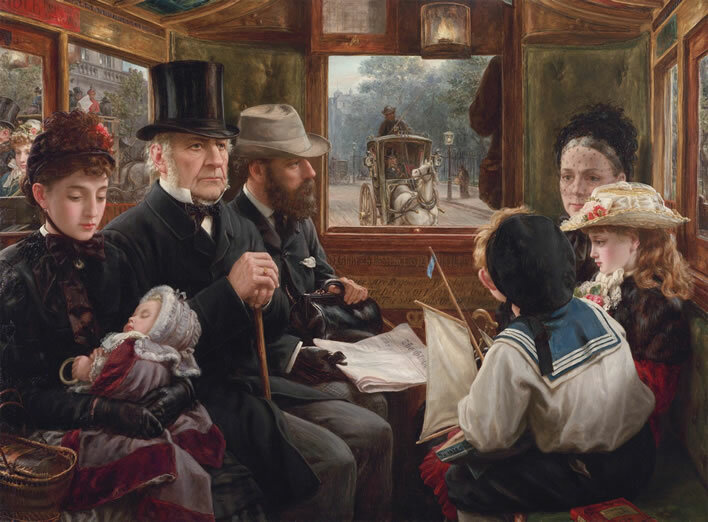 Alfred Edward Morgan (1835-1924), An Omnibus Ride to Piccadilly Circus, Mr Gladstone Travelling with Ordinary Passengers, 1885. Whether this painting triggered the idea for the imagined film scene with Churchill on the Underground only the film's creators know. The scene with Gladstone was also imagined – which is not to say that Gladstone never took the Omnibus. The ordinary passengers are, in fact, the artist and his family. Morgan and his wife Jessey are seated in the far corners with daughter Jessie and son Owen seated beside their mother, the identity of the lady with the baby is unknown. There are wakeful swots among our mostly slumbering readership who will remember that we used this painting in another context in our Scrapbook for October 2016. 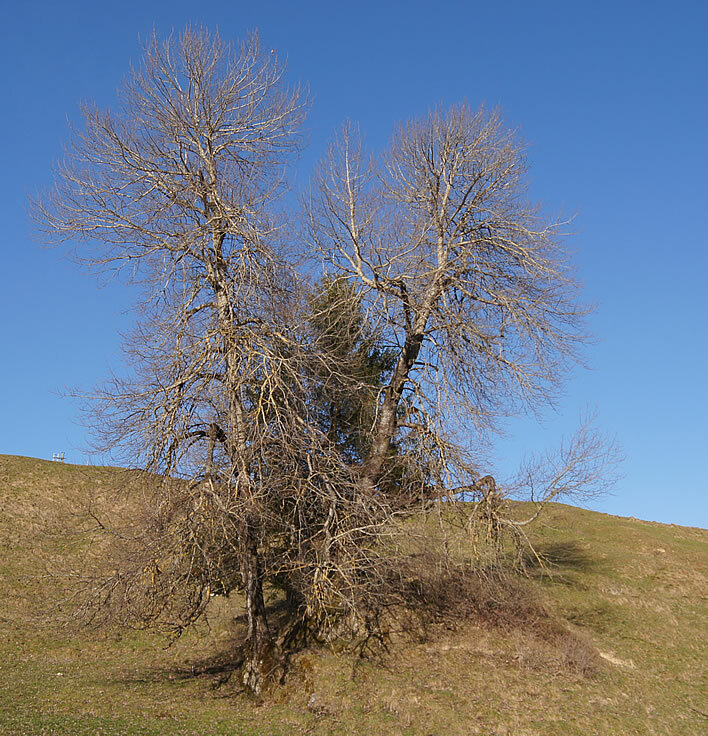 Where are the leaves? WINTER! Where is the snow? FÖHN! Confronted with photographs taken in Pinderfields' Accident & Emergency department on 2 January 2018 of patients lying on the floors, David Melia, Director of Nursing and Quality at the Mid Yorkshire Hospitals NHS Trust, which runs Pinderfields, said the Trust had received no complaints regarding the care of the two patients identified in the photographs, 'who may have chosen to lie down as seats were provided'. People were sitting around in chairs, shivering. In 2018 people should not be having to sleep on the floor without either a pillow or a blanket. If you were in prison you would be offered a pillow and a blanket – and a bed. The man who was lying on the floor at the bottom of my husband's bed was being sick. He was asking for a trolley to lie on but there wasn't one to give him. He was there for a few hours. People were stepping over him. I never expected to see that. You can understand people being tired and lying on the floor but it was not really like that. People are waiting hours and hours and hours and have to sit on hard metal chairs. After you have spent so many hours sitting in a chair when you are poorly you will get into any position you can to be comfortable. 'Click-clack' go Madame Defarge's knitting needles. Same procedure as every year, Miss Sophie! Emergency medicine consultant Dr Adrian Boyle, chairman for quality at the Royal College of Emergency Medicine, said: "Everybody is struggling at the moment". He told the Press Association, he said: "Every type 1 emergency department that I know of is under serious and sustained pressure. "It feels worse than the equivalent period last year. "This means that ambulances are waiting outside emergency departments waiting to offload, the emergency departments are full, clinical staff are working extremely hard to try and look after these patients, often having to treat patients in corridors, people suffering lengthy delays. Exactly the same things could have been reported about the UK National Health Service (a.k.a Envy-of-the-World™) every winter for the last 20 years. Every year the tractor-production spin is the same: 'struggling', 'working extremely hard', 'sustained pressure', 'high bed occupancy levels' (=the fault of the patients), even 'the Health Secretary is away on holiday' is alleged to be a reason for the disasters. How much more completely avoidable human misery will it take before this communist soup-kitchen is dismantled and a properly funded and organized health system set up in its place? 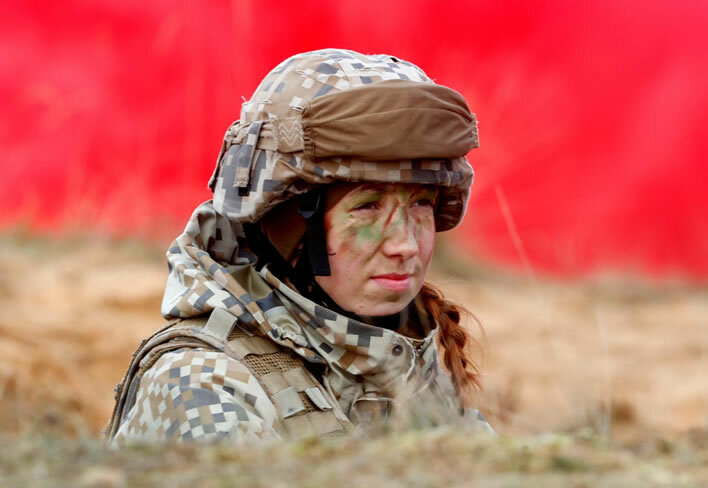 Gender-neutral advice to soldiers: never forget your lippy. Just perfect for those red backgrounds: a soldier of the Latvian army during the NATO exercise 'Silver Arrow', held in Latvia in 2017. Image: ©Ints Kalnins/Reuters. Every year the Bundesrat, the Federal Council in Switzerland, chooses a President for the year from their number and has a photograph taken. 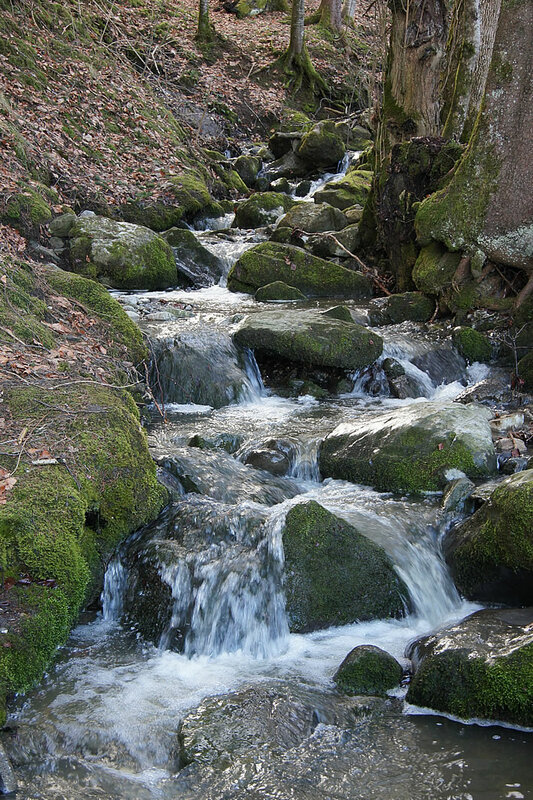 The Swiss people expect their masters to be dull workhorses who serve them in unrelenting drudgery for years on end. The writing has been on the wall for some time for those with eyes to see, but modish infantilism has now undeniably overcome even these drudges. This is their 2018 group photo. [Click to view the larger animated version in a new tab –if you think can stand it]. Some Swiss people wondered whose funeral it was from which their Nestors have just returned. Simple people! The background is, in fact, animated and the infants standing in front of it are required to wear something that will work with a digital bluescreen process. Hence the black suits. The content of the background is infantile and not worthy of discussion. Perhaps it is an insight into their minds. Yes, yes – this must be what's going on in their heads. There is very little in this image that is real – meaning that the Swiss Government has managed to produce the first post-truth fake news of 2018. Plucky little Switzerland!